Yes, the talk given by Michael Voris has finally made it onto RealCatholicTV, and it's now on YouTube. So, you no longer have to rely on my sketchy outline of the talk (though the subsequent blognic wasn't filmed, so I have the advantage there!) but can watch it yourself. Major twitch of the mantilla to Paul Smeaton for organising the whole shebang. Michael Voris also did a piece on the Tyburn Martyrs, which you can watch over at Smeaton's Corner. The start of the Autumn Term is always a little fraught, in my experience. 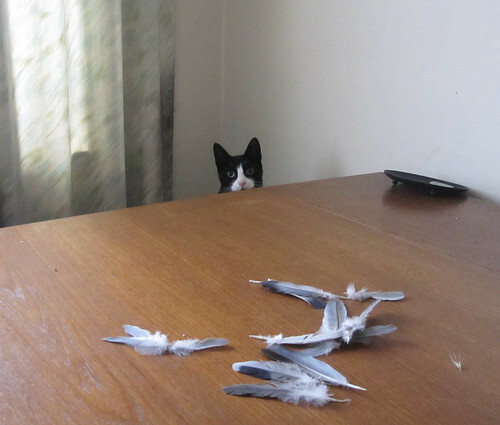 It is made slightly more fraught for me because of one fateful morning in particular (you can read more about it if you wish) which I'm always worried will recur. So, not much sleep was had by me on Wednesday night. The longest stretch was about 20 minutes. I slept badly on Thursday night too. By Friday evening, I was pretty much dead on my feet. I sat down to put my aching feet up for half an hour, and woke up, bleary-eyed (contact lenses still in) but otherwise wide-awake at midnight. 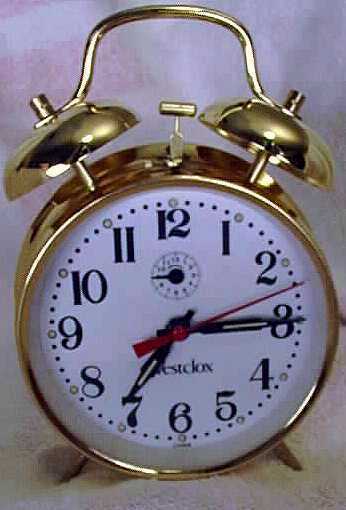 The next thing I knew, it was 10:15am. Mass on Saturday is at 10:30am. Oooops. 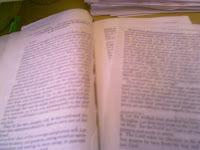 In the meantime, until I get myself sorted, blogging might be a little sporadic. Today was my first day back at school, and, afterwards, I went straight to church for my Thursday evening dose of Rosary and Benediction. ...Errrrmmm, sorry, that headline was not quite right. My bad! 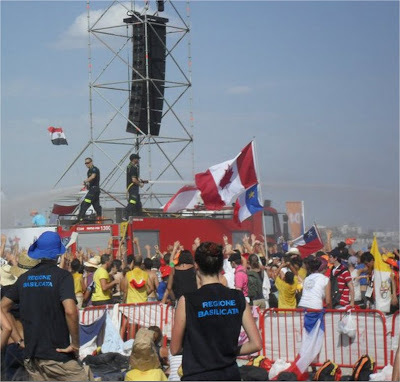 These young people were actually at World Youth Day, and were sprayed with water by firemen to keep them cool in the soaring temperatures. The pilgrims also had sympathetic local residents flinging buckets of water over them as they walked passed en route to some of the events. Young people = 1,500,000 (minimum); Riots = 0. Mantilla-twitch in the direction of His Hermeneuticalness. A little bit of good news... I have just arrived home after a horrible journey on a crowded bus to find two kittens waiting for me inside the house (one has now gone off gallivanting, the other is having a nap on the sofa... it seems that they like to know I'm safely at home before they go off and do their respective things!) and one car waiting for me outside the house, new alternator and new front tyres fitted. 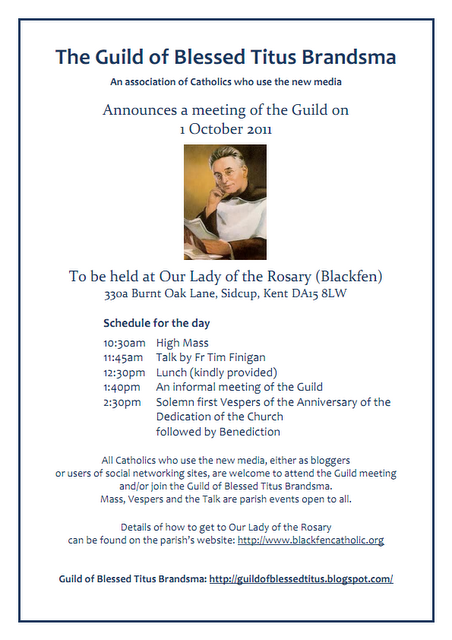 The Guild of Blessed Titus Brandsma is holding a meeting at Our Lady of the Rosary Church, Blackfen, on Saturday, October 1st 2011. 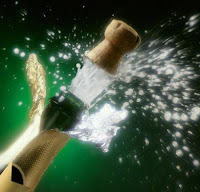 Everyone is welcome - "bloggers" being a very loose term! I have to confess to feeling a little bit strange, knowing that tonight was the last time we shall use the old ICEL translation for the responses at Sunday Mass (still a few more days until September). Don't misunderstand me, I am absolutely delighted that the "lame-duck translations" (as the inimitable Fr. Z terms them) have finally shuffled off this mortal coil. We have had the new translation of the Canon for a while, and it is a vast improvement. I have been mentally responding "And with your Spirit" to help get myself accustomed to the changes. And I shall make an extra effort to attend the 6pm Mass next Sunday so as to usher in the new responses. As I said, it's just a little... strange!